You could say that I’m on a spicy, cheesy food kick. 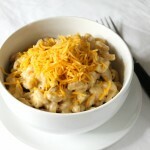 I mean, after I made that Chipotle Gouda Queso Dip last week, it’s been one of the only things on my mind. What can I say? 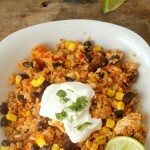 I’m a girl who likes spicy, cheesy foods. Pizza was on the menu plan for dinner yesterday and I had a lonely little jalapeño sitting in my fridge, begging to used—so making a jalapeño popper pizza was an absolute must. Once I had the idea into my head, it was all I could think about all day. And once I finished a slice, I suddenly wished I had made another pizza. Seriously. There was no way I was getting a second piece once my family had a taste of it. Everyone agreed that it was one of the best pizzas they’ve ever eaten. And I can vouch for that. 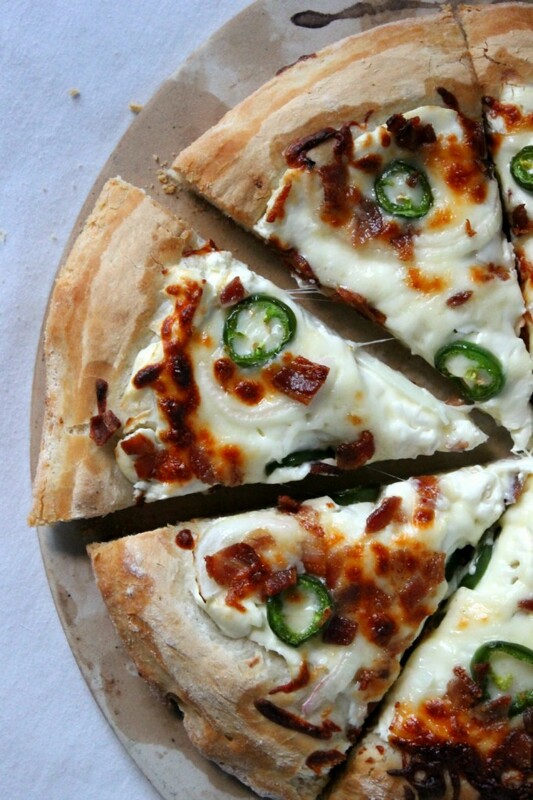 This jalapeño popper pizza is spicy, cheesy, bready, savory, and like love in your belly. As you all probably have figured out by now, I am in love with pizza. I don’t eat the frozen kind from the store or call pizza delivery for obvious reasons, but you CAN feel good about eating homemade pizza because you can control the ingredients going into every pizza you eat. Pizza dough: I like to use my recipe for homemade pizza crust (and it is the best homemade crust I’ve ever made) because it gets crispy and a little crunchy on the outside, but it’s soft, chewy, pillowy heaven on the inside. You could also use pizza dough from the store for convenience, but I would make sure you get it from somewhere like Trader Joe’s, Whole Foods, or Earth Fare just to be on the safe side. Cream Cheese: It’s one of the key essential flavors in a jalapeño popper, and I could probably eat a whole brick of it by myself (ahem). 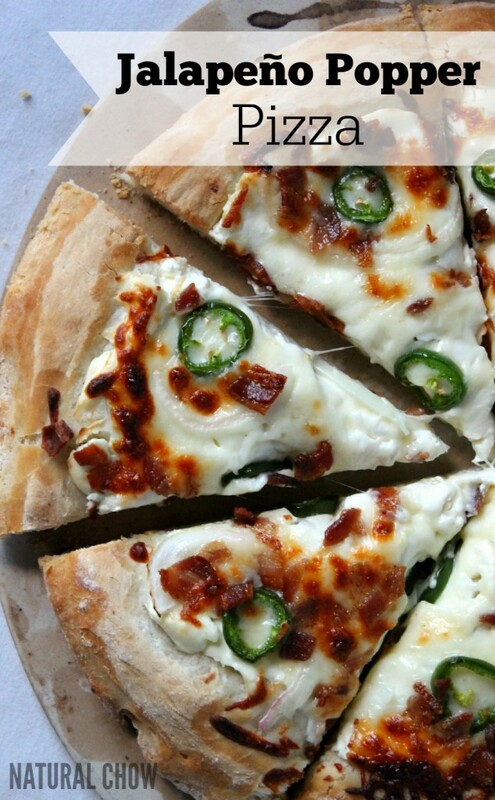 But you’re going to want softened cream cheese, because cold cream cheese is a little hard to spread on pizza dough. Mozzarella Cheese: You can actually use any kind of cheese you’d like—colby jack, pepper jack, gouda, parmesan, you name it! I personally like to use mozzarella because that was what I was raised on, but you can use whatever you want. Jalapeño Peppers: You only need one, and I recommend looking for an organic one at the grocery store or, even better, grabbing one out of your garden. And a word of caution: use gloves! Even just touching a jalapeño makes my skin burn. And be sure to keep little kiddo’s out of the kitchen. Yellow Onion: I literally only used half of a tiny onion for this pizza because you really don’t need much. 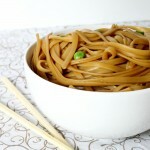 You can also use scallions or a red onion if you’d like. Bacon: You can’t forget the bacon. You know how jalapeño poppers are usually wrapped in bacon? Well, for this pizza we’ll bake them in the oven, then cut ‘em up and sprinkle ‘em on. You can’t go wrong with bacon. Unless of course you’re a vegetarian. Or vegan. Aaaaand moving on. So, enough talk of ingredients. In a word, this pizza is extraordinary. Even as I type this, I’m secretly craving another slice of this delicious pizza. 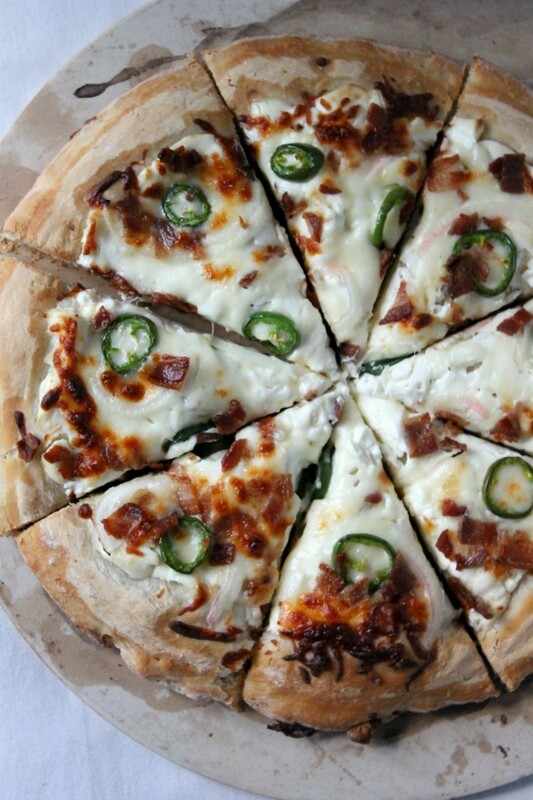 If you like jalapeño poppers, then this pizza is for you. I don’t make jalapeño poppers all that often, but when I do they disappear in seconds—which is exactly what happened with this pizza. 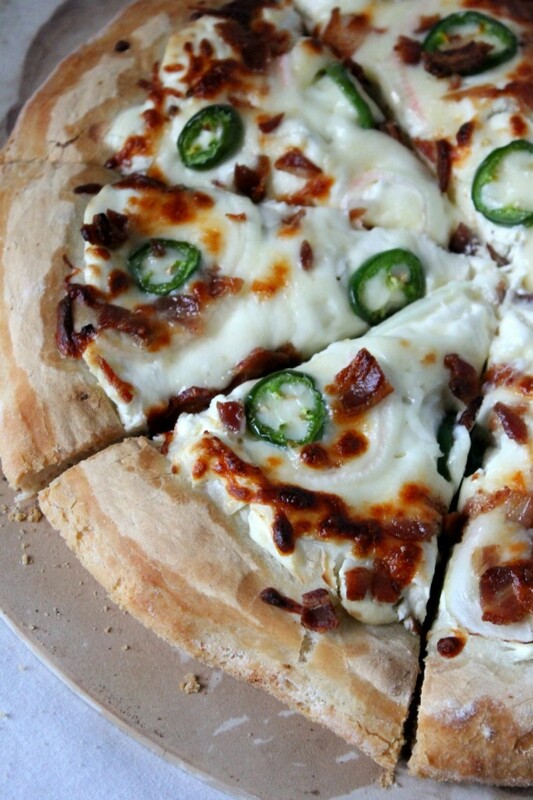 You are going to love this jalapeño popper pizza. 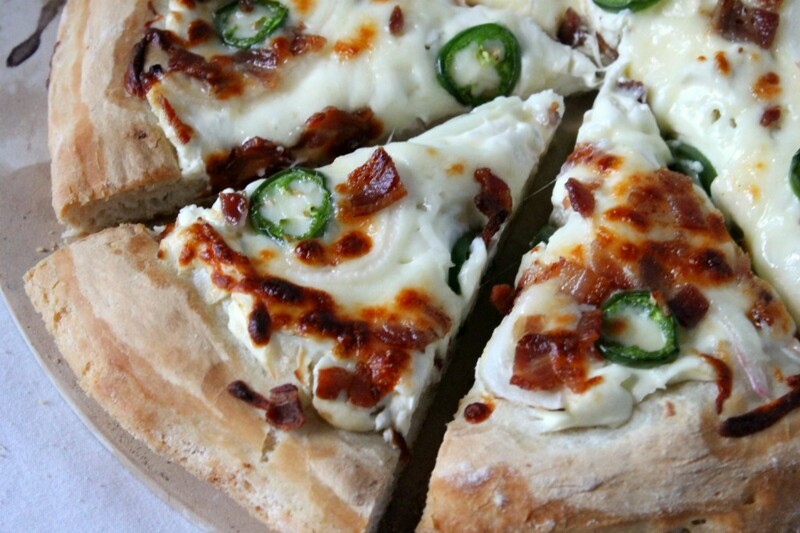 With it’s spicy, cheesy, savory toppings and it’s crispy, bready crust, you’ll wish you had made a second pizza. 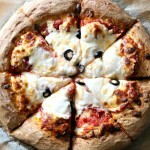 Preheat oven to 475 degrees F. Lightly coat a pizza pan with olive oil. Place the bacon on a cooling rack on a cookie sheet and bake for 10 minutes or until completely cooked. Chop on a cutting board. Set aside. Sprinkle cornmeal onto prepared pizza pan. Roll out the pizza dough (or use your fingers) to measure about 10 inches across. Carefully transfer to prepared pizza pan. 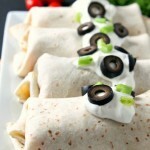 Spread the cream cheese evenly over the top, leaving a 1-inch border. 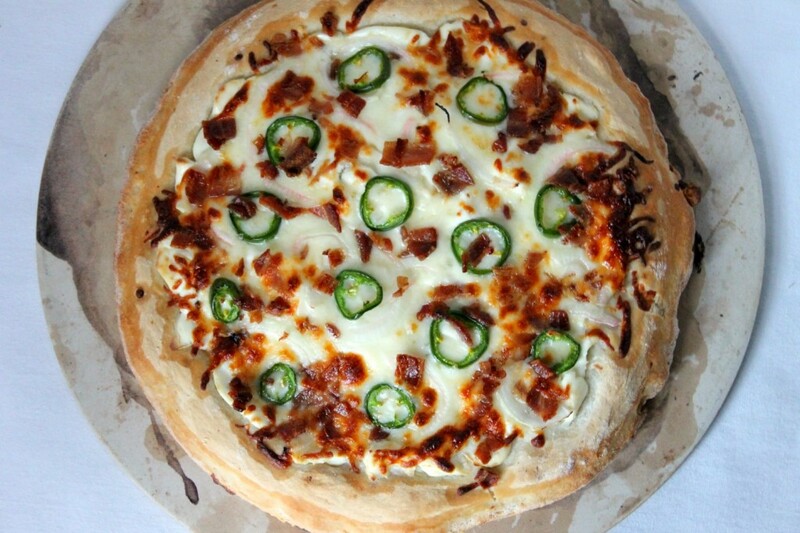 Top with mozzarella cheese, jalapeños, onion, and bacon. 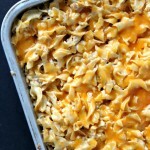 Bake for 15-20 minutes, or until the crust is golden brown and cheese is 100% melty goodness. Slice the pizza using a pizza cutter and serve. I love poppers, and this looks delicious! I like to eat a lot of pizza It is delicious And it makes me fat today. This is awesome! I made one tonight and it may very well be the best pizza I’ve ever made! I left off the bacon though, as I don’t eat meat. Still delicious.